CHINA, Yanji -- For The first in a series of interviews I’m conducting with young volunteers around the globe, I spoke with Sarah Dickhut, an English teacher in Yanji, China. Dickhut graduated from Loras College in 2013 with degrees in Biological Research and Philosophy, and will attend law school at University of Iowa this coming fall, where she hopes to combine law and philosophy to advocate for and raise awareness about major issues in international human rights. Dickhut teaches at Yanji International Technical Cooperation High School, a boarding school for about 200 students of Chinese and Korean descent. Situated among farmland and pastures, this school is a quaint relief from the bustling downtown just minutes down the road. With a population of half a million people, Yanji is considered a small town by Chinese standards. Situated on the border of North Korea and Russia, Yanji is a busy transportation and trade link between North Korea and China, and Yanji’s population is largely ethnic Korean. 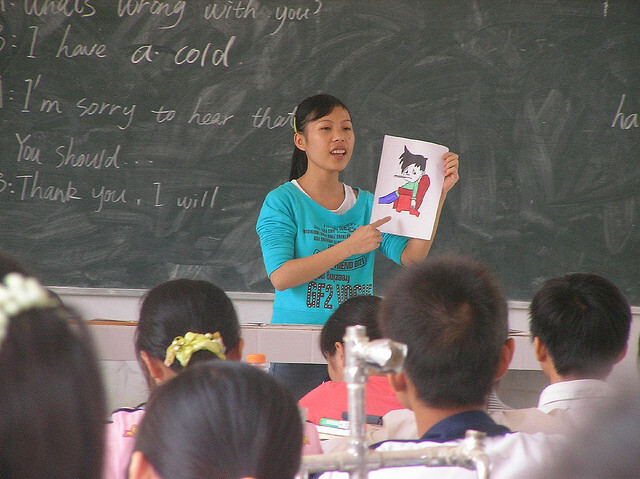 What prepared you for the job of being an English teacher in China? I’m currently working as a high school teacher in a technical school, which is a subject area which differs from my degrees, so I haven’t had a lot of job-specific preparation. However, I think service in general has helped a great deal in providing me with a “willing heart,” and frequent consultation with other ESL teachers has been very useful. Has there been a defining moment in your life that made you decide to take the direction you did in teaching English in China? What were your thoughts about China before you arrived and how have they changed or stayed the same? A few people vocally expressed (an unfounded) concern for my safety, which initially cast a little bit of a shadow over my excitement. So after that, I really tried to avoid preconceptions or assumptions about the country. What is one common misconception people might have about China? The most common misconception I’ve encountered about China is that it’s extremely dangerous. In reality, as long as you avoid trouble with the government, the threat from other citizens (mugging, murder, kidnapping) is extraordinarily low. The biggest concern is really pickpocketing. What kind of reception have you been given in Yanji? The teachers at our school have been very cordial; the most common way I’ve experienced hospitality is through a meal. It’s not uncommon for the English department, or for the whole school to go to dinner together. How do students usually react to you when you first meet them? Most students have never seen a foreigner before, so when I first meet a class it usually goes like this: I walk in the door, the students audibly gasp, I say hello, and there’s a few minutes of shyness before I get them talking in English. What is a typical workweek like for you? I teach conversational English to three different grades of high school students, and based on the Chinese class schedule I have about two classes a day. The government provides a conversational English textbook, but as long as I cover the main topics and grammar patterns I have a lot of freedom to develop creative lessons. Some of the ones I’ve particularly enjoyed teaching include lessons on the psychology of personality, American slang, and a murder mystery game. How does this compare to the workweek of other teachers in your school? Because the Chinese educational system is completely controlled by the government, they control the curriculum, number of classes, and number of teachers. The government’s control over teaching jobs causes them to hire as many teachers as possible within one school. Consequently, each teacher has considerably fewer classes per day than the average American teacher—no more than four 40-minute lessons a day. This means that I’m doing approximately half of the work of the average Chinese teacher. How is your school alike or different from other schools you’re familiar with? Since our school is a technical school, the prevalent attitude among the teachers is that classes are not so much preparation for future education as they are to help students develop into better people. So there’s a lot more flexibility in grading and the rigor of classwork. Additionally, the school allows students quite a bit of free time; they have an hour and a half for lunch, and at least one free period every day. As I mentioned, the same relaxed attitude seems to apply to the teachers. There is less demand to prepare lesson plans in advance and most teachers have time for a nap every day. Can you explain the educational system in the part of China you live? Structurally, our school is designed and painted exactly the same as the other high schools in the area. This system of “equality” is carried out to such an extent that even the color of paint within the schools is exactly the same. Our school does differ, however, in that it is an international endeavor between China and Korea. Basically our school is funded by both Chinese and Korean parties, and there are both Chinese and Korean administrators. The purpose is to help expand job placement for students post-graduation—we send students throughout China and South Korea. How is Yanji different from other places you’ve visited in China? I’ve had the privilege of visiting some larger cities, like Shanghai. These populous international cities house a multitude of cultures, so it’s easier to feel at home. What are the hardest parts about living in Yanji? Although Yanji is a city of 500,00, by Chinese standards it’s the modern-day equivalent of a rural village. The result is that by living in this city we are cut off from virtually all aspects of western culture. What is the most rewarding part about living in Yanji? Total immersion in a new culture, and the lack of English in the city propels me to use Chinese and Korean more frequently. What is your best memory so far? It’s actually difficult to choose a single best experience…but I think one that stands out in my mind is visiting the local ice festival. It’s similar to the ice festival in Harbin, where builders take immense quantities of ice and snow to build large structures like castles and slides. At night the giant snow-slides are lit up with colored lights. It’s a really beautiful sight. Have you found that women are viewed differently than men in Yanji? In my experience the Chinese state that intellectually women and men are equal, however they hold gender stereotypes for careers, physical ability, and child preference. In terms of careers, I have been told on several occasions that some professions (like engineers) are more suitable for men, and that teaching is the least honorable profession for men as it indicates a fastidiousness of character. Additionally, it’s assumed that in sports, all females are at a disadvantage, so activities are carefully structured to give female players an advantage. Finally, Chinese families still have a strong preference for male children, as the male will care for his parents later in life. When a female is married, she is expected to show preference for her in-laws over that of her own parents (i.e. on family holidays a couple is expected to spend the time with the male’s parents). What have you discovered about China’s 1 child policy? While the one-child policy is still enforced, there are exceptions to the rule. For example, ethic minorities (like the Chinese-Koreans in my area) are allowed to have additional children. As a result, because of the high percentage of ethic minorities in my region, I have less experience with the imbalance of genders seen in many other Chinese regions. How much of a hand do you think the government has in the lives of ordinary citizens? I guess I can answer that through the example of the typical teacher in my area. A teacher works for the government, and as such is guaranteed a job by the government. Usually upon graduation, the government will place teachers at specific schools, and may move them if deemed necessary. As the educational system is federally run, there is immense pressure for every teacher to be a member of the Communist party—in fact, it’s unofficially necessary for promotion and awards. However, if a teacher is not a member of the Party, they are still exposed to Communist ideals through their co-workers, and “training videos” which are thinly veiled propaganda discouraging religion and political activism. The average teacher likely has a phone and computer, however the government has access to all cellular data, and censors online information including websites such as facebook, twitter, tumblr, google, and virtually all blogs. Donations for natural disasters are derived from the paycheck and are compulsory. Salary and benefits are subject to change without discussion or ability to lobby. It seems the government does everything but assign a police officer to every citizen. How does being so close to North Korea impact your city? The proximity to North Korea means there are many North Korean refugees in the city. Additionally, there is a military base which is used for training and to arm the border. The city is also a hub for the transportation of goods into North Korea. All commerce is supposed to be controlled directly by the North Korean government, but as this infrastructure has been weakened significantly by economic hardships, North Koreans have built an extensive black market. Common exports from our city include food, clothing, and unfortunately, methamphetamine. You spent time in Seoul, South Korea. How similar is Yanji to Korea? Since there is a large Korean minority living in Yanji, there are tangible influences of both South and North Korean culture in my city. The most obvious is the language; Korean is an official language of the province and many people in Yanji speak Korean (albeit a different dialect). Additionally, there are a few South Korean chain restaurants throughout the city. In terms of pop culture, most residents of Yanji are well-versed in Korean dramas, and Korean pop music, or k-pop. How does it feel to be an American living in China? What is the most interesting thing you’ve observed or been a part of? Something that I still haven’t adjusted to is other peoples’ reactions to my ethnicity. There are very few people of Caucasian ethnicity in Yanji, so my features can be surprising. People stare openly, sometimes stopping what they’re doing to get a better look at my face. Occasionally people will call out a series of non-related words in English to see if I’ll respond, or if I’m walking they might follow me a short distance to get a better look.